LOOP safely and efficiently offloads tankers of crude oil that are imported into the U.S. from the Arabian Gulf, Russia, West Africa, the North Sea, Mexico and South America. Many tankers that discharge their cargoes at LOOP are supertankers and are designated as either “very large crude carriers” (VLCCs) or “ultra large crude carriers” (ULCCs). These massive ships can be longer than the Empire State Building is tall. In response to change US supply patterns, LOOP has made modifications to it’s mooring configuration to receive Jones Act compliant Medium Range (MR) tankers to receive cargoes from US ports. 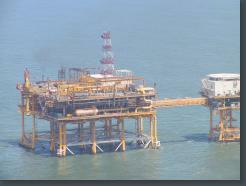 It also allows for FPSO shuttle tankers to deliver their cargo to LOOP. The LOOP oil port and pipeline were specially constructed to accommodate these enormous vessels. Standing in 110 feet of water some 20 miles from land in the Gulf of Mexico, the LOOP Marine Terminal can comfortably accommodate tankers calling at the port. Once anchored at one of the three single point mooring (SPM) buoys, hoses are attached to a ship’s manifold for offloading. 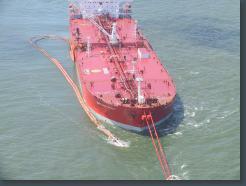 Hi-tech, flexible hoses are attached to the ship’s manifold to receive and transport the crude oil. It is pumped from the ship in an underground pipeline. Oil movement controllers from LOOP, in close communication with the ship, initiate the offloading of the vessel to the LOOP Marine Terminal where it is pumped into a 48-inch diameter pipeline to the LOOP storage facilities at a rate of up to 100,000 barrels per hour. The oil arrives at the LOOP storage facility in Clovelly, Louisiana, some 45 miles from the marine terminal. There the oil is stored in a network of underground caverns and aboveground tanks. The LOOP marine terminal, pipeline and storage facilities reside in a Foreign Trade Zone (FTZ) which provides opportunities for companies importing foreign crude oil to optimize their U.S. Customs duties.